Since I've been recently looking at Go, I continued the exercise by reimplementing the lexer (the hand-written one, not a regex-based) in Go. The full code is available here (along with a large input file used for benchmarking). That said, shortly after completing the code I started wondering if it could be made faster. There's something about Go that makes you think about performance on a low level, not unlike when programming in C. Maybe it's because so many things are explicit - pointers, slices, etc. That toks = append(toks, nt) in particular. As the size grows, toks will have to be reallocated and all its contents copied over. Since the input in my case had close to 200000 tokens and reallocation doubles the slice size, this means that in the order of 16 reallocations have to happen here, each time copying all the elements over. If that sounds like a lot of wasted work to you, that's because it is. 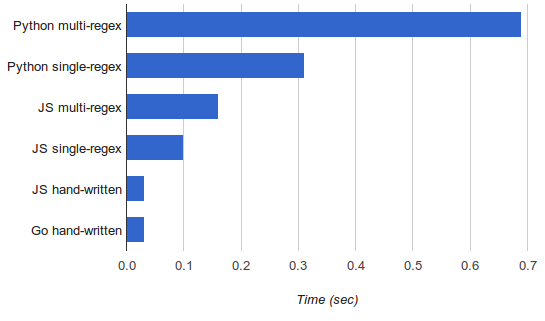 And wow, the runtime dropped from 33 to 20 ms, making it 33% faster than the JS version. To be fair to JS I tried to perform the same optimization there (instead of pushing onto an array, create a large one in advance), but this has actually made things slower. Some sources online claim that V8 (which is what I'm running underneath, since my local code runs on Node.js) doesn't like preallocating large arrays. So as is often the case with benchmarks, it's difficult to do an apples-to-apples comparison here. A hunch tells me that in a fully optimized (by a programmer skilled in the language) version of this benchmark, Go would still win, because its nature (typed, compiled to native code, and exposing a lot of low-level details) make it easier to reason about in terms of performance. But performance was not really the point here - I just wanted to see how easy it is to reimplement the same lexer in Go. Hopefully the code would be useful/interesting to someone; please let me know what I could've done better.